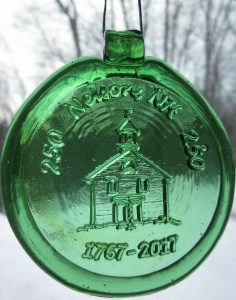 These medallions (now sold out) depicting the Old Brick Schoolhouse in Nelson Village (now our town offices) were produced to commemorate our 250th town anniversary. They were made in four colors (blue, green, amber and amethyst) from recycled glass using centuries old techniques – giving each piece an odd character not found in machine work. They were made by Chris Salmon of Old Hancock Glassworks. Chris uses an old technique of carving a graphite die for pressing a relief image into molten glass at his workshop in Antrim. He learned the technique while blowing glass for a factory in Germany in 1973. Over the years, he has adapted new machinery to help him render the relief carving with more detail. Chris’ experience in the now rare art of working in relief helped to bring Karen Tolman’s two-dimensional drawing into three-dimensional glass.